One of the largest city and the capital of Rajasthan, also known as “Pink City” which has become a major tourist place among both national and international tourists. Jaipur is famous for itshilltops and stunning fortresses and also for handicraft items and exquisite jewellery and mostly people come here for shopping as it offers best traditional Rajasthani work and having different types of products like tie-n-dye, bandhej sarees, kurtas and dresses material. While, talking about its food, most of the delicious items include vegetarian specialities and also it’s famous for sweet dishes like gewar and pheni which are available in a particular festival. One of the most popular items is Dal Bati Churma which is the core dish of Jaipur. 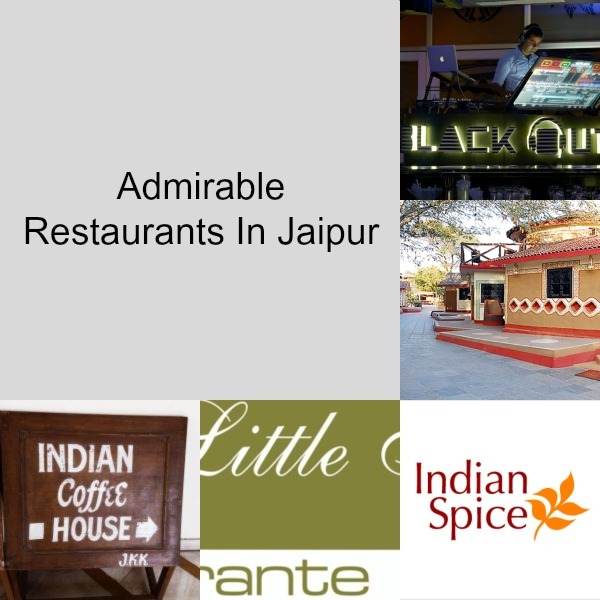 As, Jaipur is famous for its tourism so for the tourists and for locals, there are some admirable restaurants in Jaipur that are center of attraction. It is one of the traditional restaurant which serves classic and mouth-watering traditonal food such as Dal-Batti, Sangri, Sag-gatta, Lassi, Rajashthani meethai, namkeen with full entertainment like folk dance and you can also experience ethnic village life. One of the best place to hangout with friends and collegues, as this restaurant serves food at its best such as sosaties, kebabs, chicken wings, grilled basa with lemon caper sauce and also sandwiches and pizza are there too. Want to eat delicious and spicy food ? Then Indian Spice is one of the best restaurant for it. It serves different types of soups such as Tomato Soup, Hot nad Sour Soup, Sweet Corn Soup and also Papad Roll, Kastoori Kabab, Crispy Baby Corn as starters. One of the best restaurants in Jaipur which provides Italian food and also serves starters, soups, variety of pizzas, pasta and desserts. Looking for a cafe, then go to Indian Coffee House which serves beverages, soups, salads, starters, sandwiches, momos, Chinese, Italian, pastries, cakes and cookies.